Privacy filter keeps confidential information private. 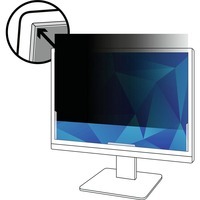 With effective black out privacy from side views outside the 60 degree viewing angle, only persons directly in front of the monitor can see the image on screen. You get crisp image clarity on your monitor while visual hackers with side views are kept in the dark. Filter is great for high traffic areas and open office environments. Filter is designed to fit wide screen monitors with a diagonally measured 18 12 viewing screen and a 169 aspect ratio. Viewing area dimensions are 16 18 wide x 9 116 high 408mm x 255mm. Filter is reversible between a glossy side and glare reducing matte. The matte surface helps reduce glare and hide fingerprints so you get crisp image clarity on your screen. Filter also reduces 35 percent of blue light transmission from the display. Lightweight, thin, frameless design protects display from dirt, debris and scratches. Clean easily with a soft cloth and water.